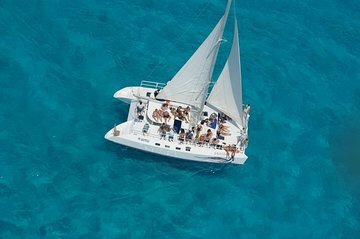 Sail from Riviera Maya to Isla Mujeres aboard a catamaran on this full-day tour. Relax on the boat deck and enjoy the scenery, then stop to snorkel and swim with the guidance of the boat's crew. In Isla Mujeres, explore the small island's souvenir shops, restaurants, and beaches at your leisure. Lunch at an Isla Mujeres beach club and open bar on board the catamaran are included.